Developed by SID On, Fat Jump Pro is an addicting and fast-paced platform game. 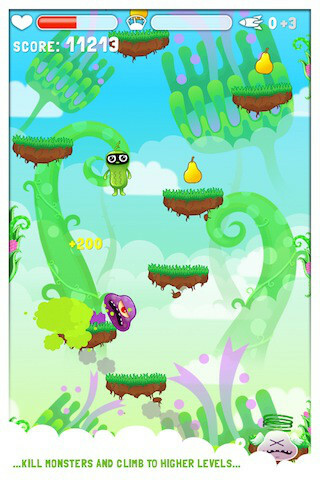 Similar to Doodle Jump, the object of the game is to jump from platform to platform while dodging monsters and collecting power ups. 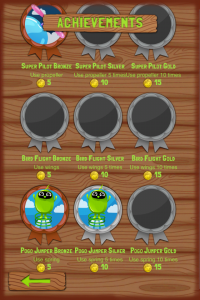 However, Fat Jump Pro adds a unique twist to the popular platform genre. The game starts with the main character (we’ll call him Jumper) sleeping peacefully. The Purple Monster comes along and steals fruit from Jumper’s refrigerator, causing him to become distraught in a ridiculously cute way. 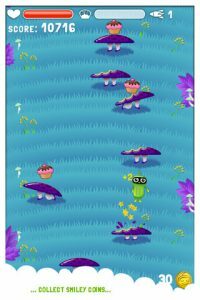 Instantly your heart is melted, and you make it your goal to help Jumper on his journey to re-collect his lost fruit and defeat the Purple Monster. Gameplay is very easy to learn and tilt control allows you to precisely maneuver your little green hero. As you progress you encounter various kinds of food such as fruits and sweets. Collecting healthy food keeps Jumper thin, and collecting sweets such as biscuits and muffins makes Jumper fat. If he becomes too fat, the height of his jump is reduced significantly until you eat more fruit and slim him down or you miss a platform and Jumper perishes. The background music and sound effects add to the cuteness of the game. There is an option to turn on “crazy sounds”, which can be heard when Jumper consumes too many sweets. 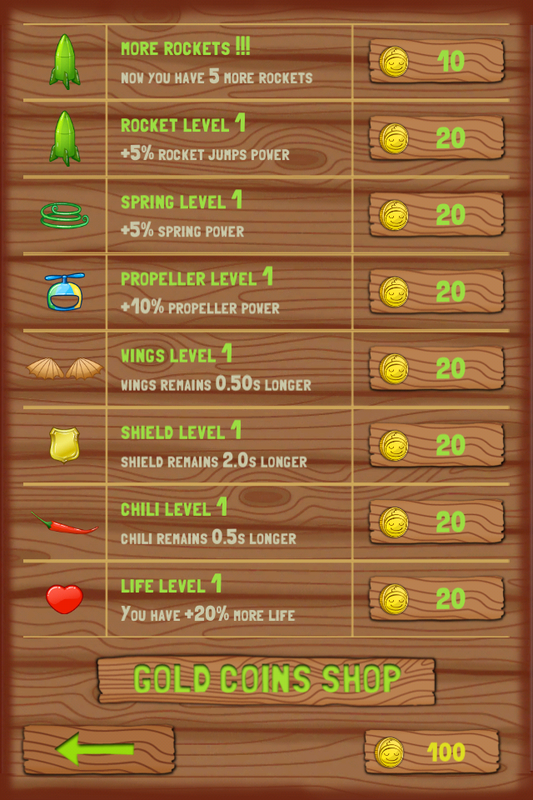 Gold coins are available to upgrade power ups and unlock levels. 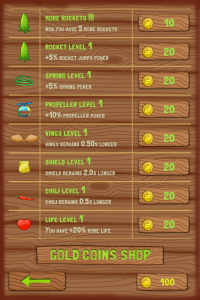 You can collect these coins in the game or purchase them through the app. Additionally, you can earn achievements as you progress through the game. Each achievement will award you a certain number of gold coins, encouraging you to jump your best. Fat Jump Pro allows integration with OpenFeint, Game Center, Twitter, and Facebook. Also, the game is designed for both the iPhone and the iPad. Fat Jump Pro is compatible with iPhone, iPod touch, and iPad. Requires iOS 4.0 or later. A small expedite fee was paid by the developer to speed up the publication of this review.